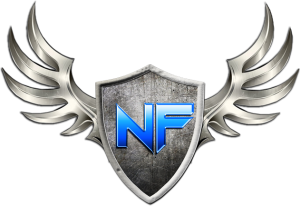 After over a year of fighting, Nova Force has finally won the war against Zaragas Energy Corp on behalf of the Intergalactic Nova Republic. This is a monumental day for the people of INR. Cheers of joy and relief spread across the system as control of the systems major station, Jenner Hub is transferred to INR. Admiral -Boston- of Nova Force was quoted speaking about the victory with Aide Yareli Castro of the Intergalactic Nova Republic. Today is a great day, not just for the people of INR but for all the people of Zaragas! 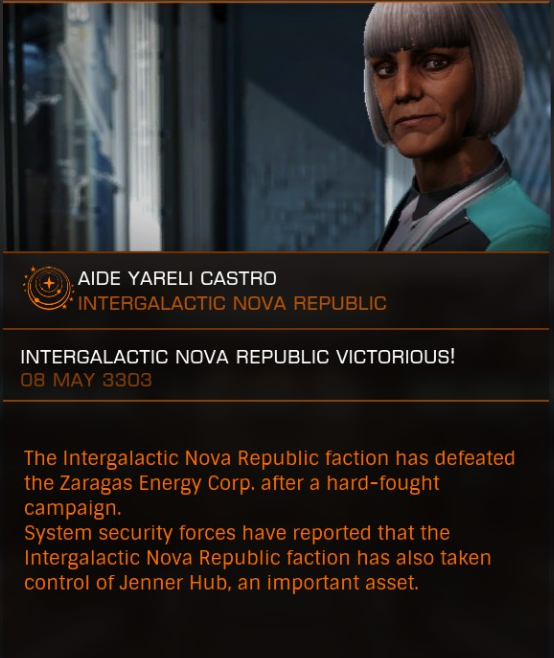 We urge all citizens still living under ZEC’s rule in Morin Hub to join us at Jenner Hub for a celebration of our victory and to ring in the first ever Zaragas Freedom Day! 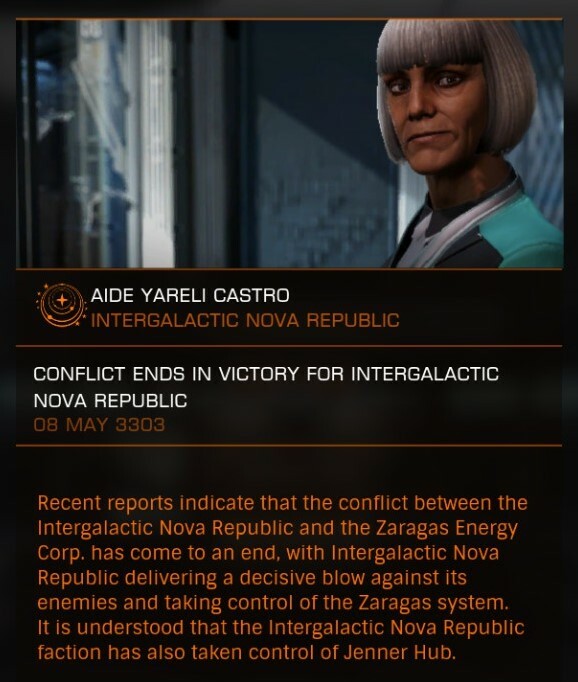 The new holiday will be celebrated every year on May 8th to remind us of all the CMDRs lost during the war of 3303 and to ensure the freedom they fought and died for remains strong in the spirit of the Zaragas people for years to come. All CMDRs still working on Zaragas Freedom Day are ordered to trade in and out of Jenner Hub to replenish supplies for the celebration. Just remember no more smuggling of illegal goods. Images: The visual guide is from CMDR ColdGlider for Radio Sidewinder and Kal. 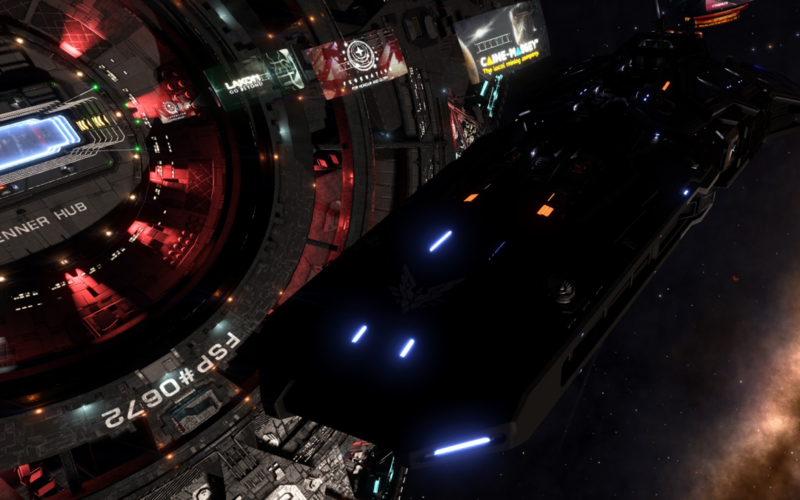 Elite Dangerous and Frontier Logos and Media are Property of Frontier Developments.